Pam Bustin was born in Regina Saskatchewan and raised in a host of small towns across the prairies. She currently lives mostly in Chapleau Ontario with a lovely man and 10,001 books – though she still tends to wander. Pam’s play Saddles in the Rain had its world premiere at 25th Street Theatre in Saskatoon, won the John V. Hicks Manuscript Award and is published in the anthology The West of all Possible Worlds. Her other stage plays include barefoot and The Passage of Georgia O’Keeffe which have traveled to Fringe Theatre Festivals across Canada. Three of her radio dramas (Coffee in Lloyd, The White Car Project and Talking with the Dead) have aired nationally on the CBC and her fiction and non-fiction work has appeared in The New Quarterly, Cahoots Magazine, Spring! and Transitions. 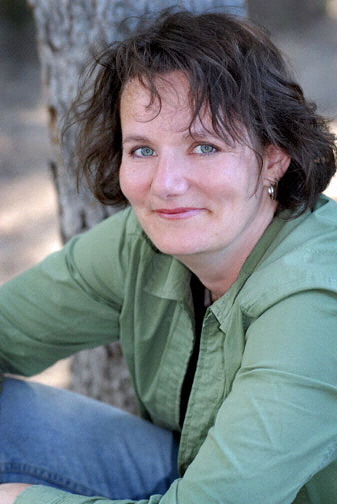 Her novel, Mostly Happy, was published by Thistledown Press and won the First Book and Fiction awards at the Saskatchewan Book Awards (2008), made the Pennsylvania School Librarians Association’s YA Top Forty Fiction List and won the Ontario Library Association’s White Pine Award (2010). Congrats on all your success. What a joy writing can be! It can, however, also be…. a pain in my tuckiss. Just kidding but I bet you know what I mean. It can be hard some days… and glorious other days. It surely keeps me coming back – and I guess THAT is the best thing. Wishing you happy scribbling and many word worlds to explore. Are you ever going to write about that crucified purple stuffed rabbit we saw in a New Mexico road medium? Oh my lawd… I have entirely forgotten this Purple Bunny. But I can picture it. Purple Bunny could be a story…inDEED miz Patti. Or at least something to slip in somewhere…. HEY…. If you have time – drop me an email and refresh my memory about the REAL Purple Bunny. I do miss that desert heat. Hi Pam! Nice to meet you via the TWUC listserv! Cheers from a fellow Prairie author. Hey Doreen – thanks so much for stopping by. And CONGRATS for your bronze medal win at the 2014 Readers’ Favorite International Book Awards. Hi Pam. Lovely to meet you. I am looking forward to reading more of your blog and work. I always knew you were one amazing lady. Having a thoughtful day. Thinking of you. You look fantastic!! A world of forever kindred spirits.